Having a system for rock removal is a proactive way to protect your machinery from damage and improve soil for crop production. At Flaman, we have a selection of reliable rock pickers and rock rakes from Schulte and Rite Way for you to choose from that feature a variety of capacities and grate widths. The Schulte RS320 Jumbo makes use of a conveyor as opposed to a reel, allowing for gentle rock removal. Its large 3.2 cubic yard hopper capacity and T-iron tapered grate that virtually eliminates jams from small rocks will save you time traveling to and from the dump point. 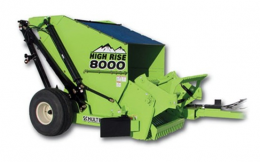 If you need more reach, the High Rise 8000 might be the solution for you. With an 8ft dump reach, this piece of equipment will easily reach higher ground for your gravel truck or rock pile, while its floating grate helps protect it from damage while in use. The newest rock picker to Schulte’s line up is the Titan 5000. This machine features a lift height of 6.5ft, a wide 7’ grate with spacing options, separate grate and dump cylinders, adjustable rock deflector and a huge hopper capacity of 5 cubic yards – all specs that mean you’ll be bale to spend more time in the field removing unwanted rocks than transporting them. From Rite Way, we provide the RR250 and RR290; low maintenance rock pickers that provide an industry first – a hydraulically driven rotary and fork type picker in one. A rock rake is also a valuable piece of equipment to aid in the removal of rocks from your land. They break down clumps, help level the ground and reclaim rocks, forming them into uniform rows. 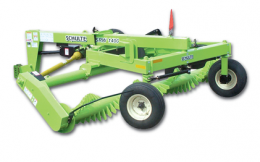 We provide two windrower options from Schulte: the SRW and SMR models. The SRW1400 and SRW1000 easily handle rocks 2”-25” with their 10’ and 14’ drum widths, while the SMR600 and SMR800 Multi-Rakes are an excellent tool for skid steers with an optional broom attachment for sweeping parking lots, roads or removing snow. Our Ag Experts, located at our 9 locations across Western Canada, are here to help you find the best equipment to meet the needs of your operation. Visit your nearest Flaman location to learn about our full range of farm implements.